Sizable, handsome villa set in vast grounds with a large, heated private swimming pool and private tennis court. 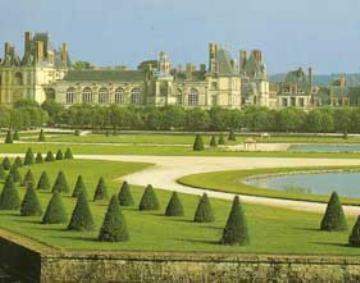 Located near Fontainbleau just 80km from Paris. Restaurants in Bourron Marlotte 2.3km. Golf 8km. The train station in Montigny s/s 1.5km. Horse riding 2km. Walks in forest 300 metres. Ideal location, not far from Paris in one of the most handsome villages around, surrounded by the unique Fontainebleau forest. Calais 354km. The second floor has a large double bedroom (1 x 140cm wide bed) and two twin bedrooms (2 x 90cm wide beds in each) best suited to children. Two bathrooms and a shower room each with toilet. Separate toilet. The first floor has three double bedrooms (2 x 140cm wide beds) and a twin bedroom (2 x 90cm wide beds) best suited to children. The ground floor has a fully equipped kitchen, living room with fireplace, terrace living room and a dining room. Music room with grand piano. Attractive décor and period furnishings. The vast grounds have sweeping lawn ornamented with mature trees and the swimming pool is complemented by a pool house. Marlotte is where Murger placed the action of "La Boheme" the well-known opera by Puccini. Minimum rental period - two weeks. The capacity is limited to 11 people. Property made available in good order and fully equipped. Linen provided. Local taxes (unless specified otherwise in the villa description), reasonable consumption of services including water, gas and electricity during July and August. Garden and swimming pool maintenance. A 10% supplement is payable on top of the low season price for Christmas, February and Easter holidays. Refundable cash deposit €500 payable locally. Six hours cleaning per week included. Outside of July and August electricity is payable locally according to the house meter reading. Heating for the house and firewood. Air conditioning (where applicable) use is payable locally. Additional services (where available) including cleaning, babysitting and cooking.